Do you dream of owning a weekend home on the water? Consider building a garage apartment! Garage apartment plans are excellent choices for weekend getaways, and many offer room to store your boat or perhaps smaller watercrafts like jet skis, canoes or kayaks. With a garage apartment plan, there’s no need to haul your watercraft back and forth to the lake, it can be stored away and waiting for you when you arrive for the weekend. Below are a few plans that offer boat storage or room for other watercrafts, plus comfortable living space. 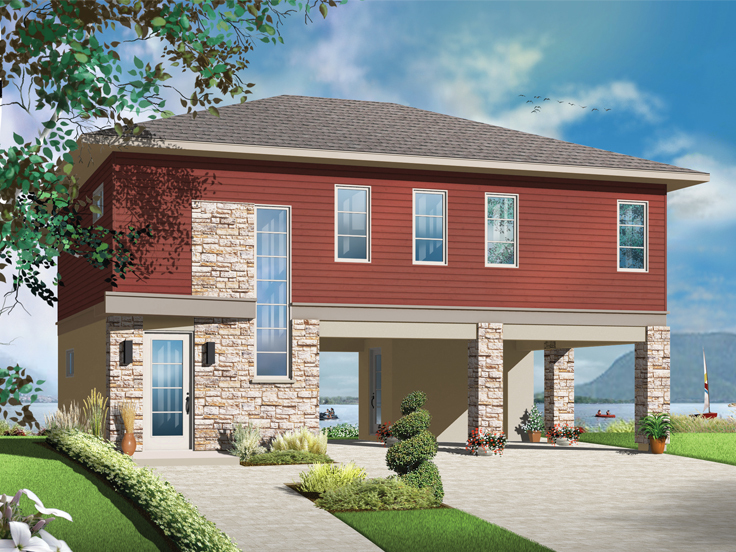 049G-0002: This handsome garage apartment plan offers two bedrooms, a place for you and the kids (or guests) to lay your weary heads after a day on the water. Extra deep garage bays store your boat and protect your vehicle. An open floor plan features a kitchen with snack bar, cozy living room and a dining area. Enjoy the ambience of lake life protected on the screen porch. With space for a stacked washer/dryer in the bedroom closet, families can keep themselves in clean, dry clothes all weekend. 062G-0101: Here is a thoroughly modern design sure to please anyone ready to get away for the weekend. The drive thru RV bay is suitable for boat storage and makes it easy to park and exit the garage. An additional bay accommodates an auto or perhaps stores a golf cart or wave runners. While the sights and sounds of the lake are enjoyed on the wrap-around balcony or from the solarium, the pets are safe and sound in their own run adjacent to the garage. Special features in the apartment include a walk-in closet, laundry closet, and sloped ceilings. 027G-0010: Check out this unique carport plan with a two-bedroom apartment above it. The drive-through bay makes it easy to park and access your jet ski or perhaps a small boat. You’ll appreciate the nearby storage closet, ideal for storing lifejackets, fishing poles and inner tubes. And yes, there is an additional bay for your vehicle. Upstairs, you’ll find a comfortable living quarters with an open floor plan. Enjoy the view from a nifty deck accessed via a sliding door in the living room. Apartment includes full bath with separate shower and tub as well as a laundry closet. For more choices like these, please browse our entire collection of garage apartment plans. If you own a boat or another watercraft, protect your investment by building a garage plan with boat storage. 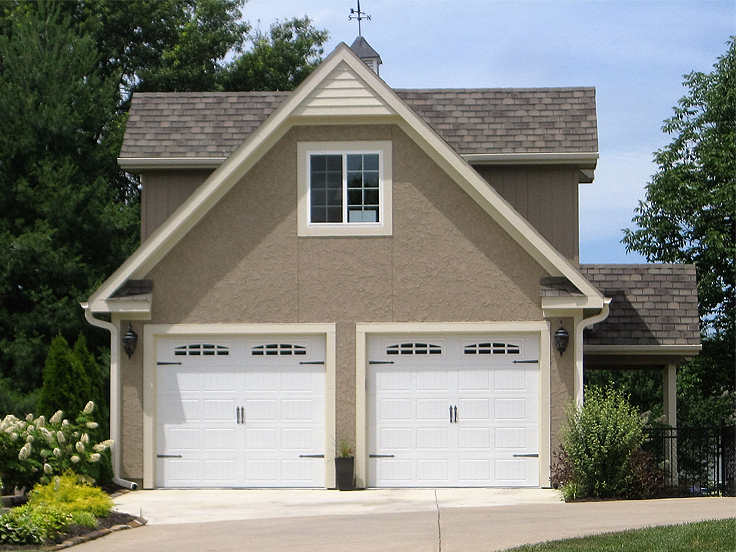 These detached garages are available in a variety of sizes and architectural styles making it easy to find one that fits your lot and blends nicely with your home. Take some time to review the following garage plans with boat storage. 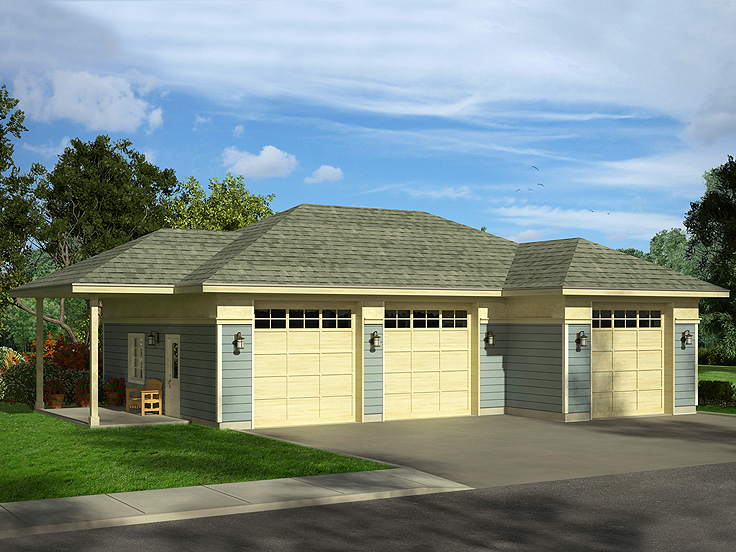 051G-0097 – Here’s a nifty 3-car garage plan that will look respectable in any neighborhood. The third bay is deep enough for boat storage, ideal for your fishing boat. The covered porch offers a shady spot for gassing up the lawnmower or taking a break from yard work, plus it provides a protected service entrance for foot traffic. 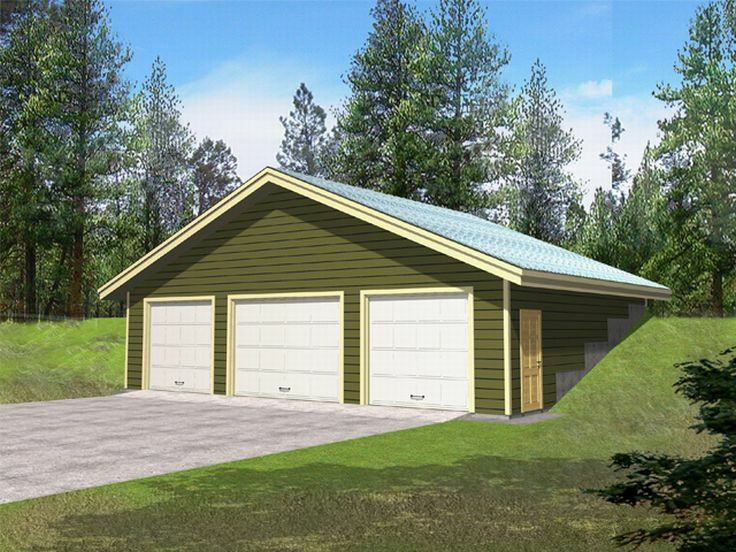 012G-0025 – This 3-car garage plan was designed for a sloping lot tucking neatly into a hillside. Three bays are all deep enough to accommodate a boat. But if you aren’t looking to house three boats, you can use the space for your antique car, pick-up truck, lawn equipment, workbench, tools, etc. This garage plan with boat storage offers a handsome addition to any homestead with a world of storage solutions. 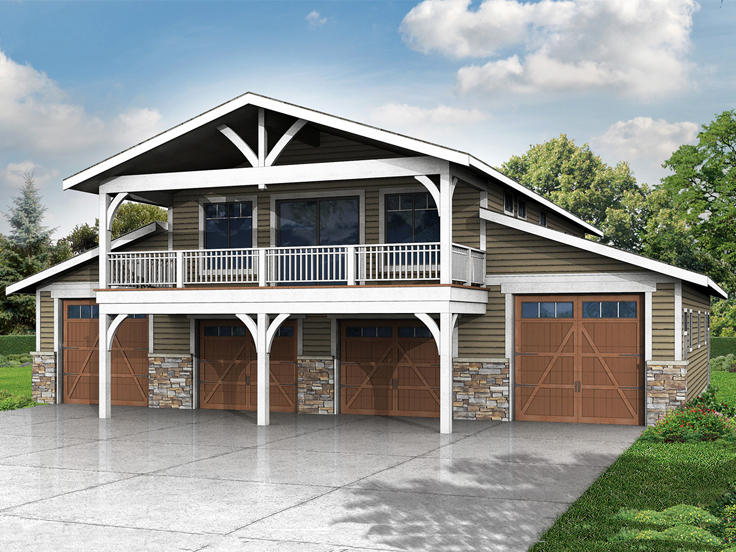 007G-0015 – A multi-material façade makes this garage plan an attractive addition to your property. It has three bays, one with a 16’ ceiling, making it ideal for a boat or RV. The storage closet at the back is perfect for keeping accessories or tools organized. Exit the service door to the patio and enjoy a deserved rest. 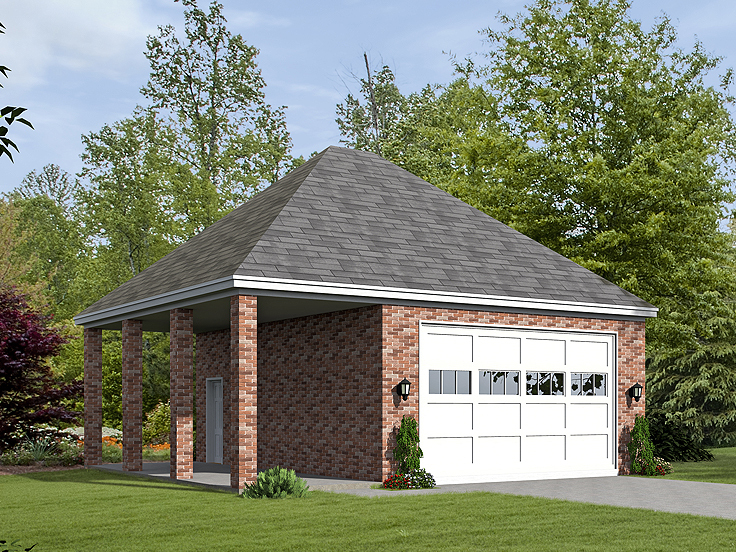 062G-0065 – Here’s a 2-car garage plan with an 18’ wide door and a 12’ ceiling. It is suitably sized for boat storage, but it also considers your lawn care needs. An overhead utility door in the back provides easy access to the riding mower and other lawn equipment. The handsome brick exterior is easy on the eyes and the covered porch offers a great space for work or play. 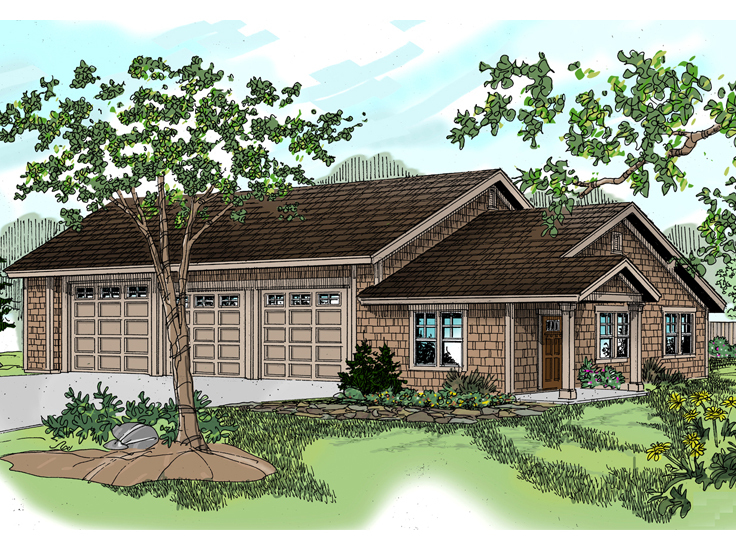 009G-0010 – Consider the possibilities of this two-car garage plan with flex space. It is deep enough to accommodate a boat, and the cheerful oft might make a great office for the captain. Or if you prefer, finish the loft as a game room, storage space, or perhaps a trophy room for displaying your greatest catches. A covered side porch offers protection for the service entrance. 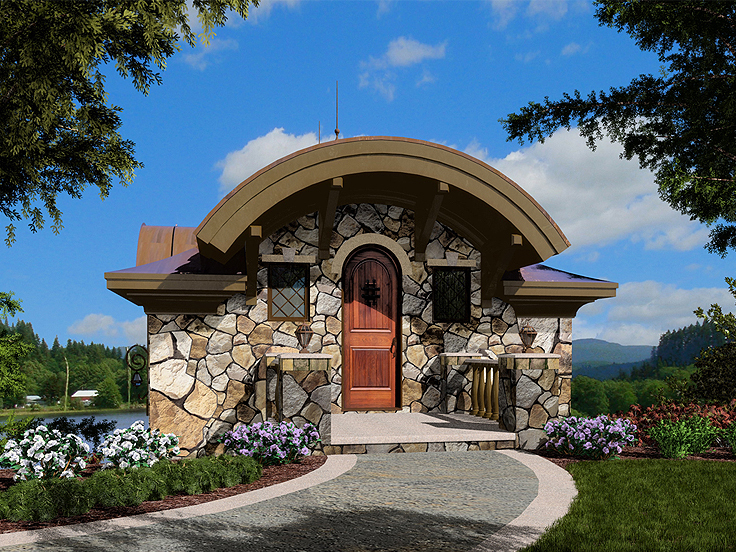 035G-0017 – From the front, this quaint stone structure with its arched roof and door, looks like a house for a Hobbit, but it is so much more. Built on a slope toward the water, this boat house protects your boat on the water. With finished living space above that include a full bath and kitchen, you can relax in style. It offers you and your guests a respite from a day on the boat. Just dock the boat below and convene upstairs for a meal, a party, or a good night’s sleep. A charming balcony provides a lakeside view for watching the sunset or for enjoying your morning coffee before departure. 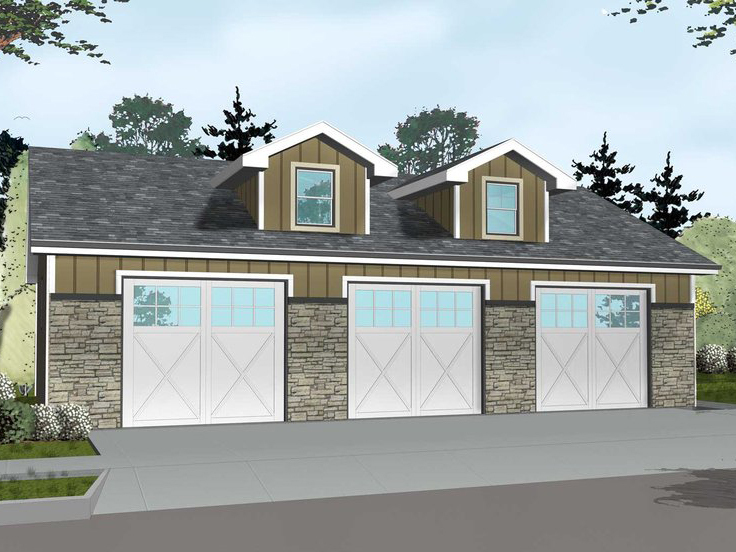 Basic Three-Car Garage Plan – 028G-0028 : This detached, three-car garage is a basic plan designed primarily for the purpose of parking three automobiles and protecting them from the elements. 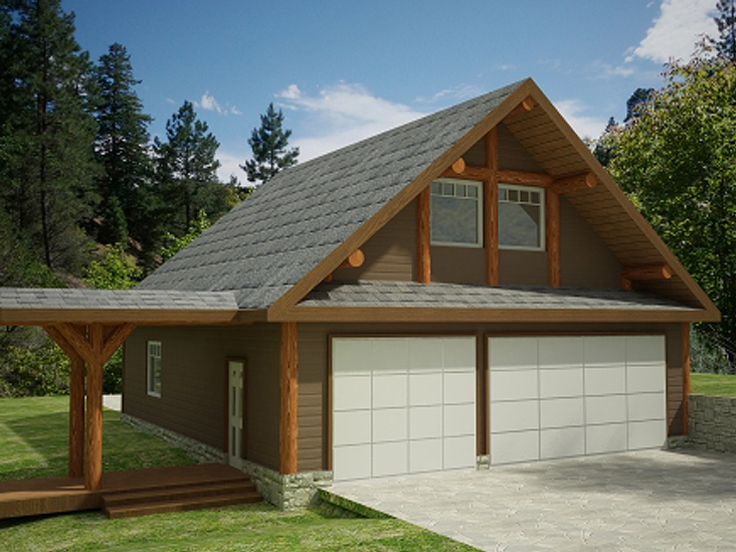 Simple garage plans like this are also suitable for storage handling basement and/or attic overflow, accommodating the family bikes, providing room from the recycling bins, and a storage area for lawn and garden tools. Garage Apartment Plan – 023G-0002: Take a look at this three-car garage apartment plan. Not only does it offer parking for the family cars on the main level, it offers comfortable living quarters on the upper level that are ideal for your weekend guests, your college student, or even the nanny. With garage apartment plans, the garage handles all of the usual expectations of a garage, but the living quarters provide versatility. Depending on your needs, the apartment can accommodate boomerang children who have moved back home after college and are seeking independence, or it can offer privacy to your overnight guests. 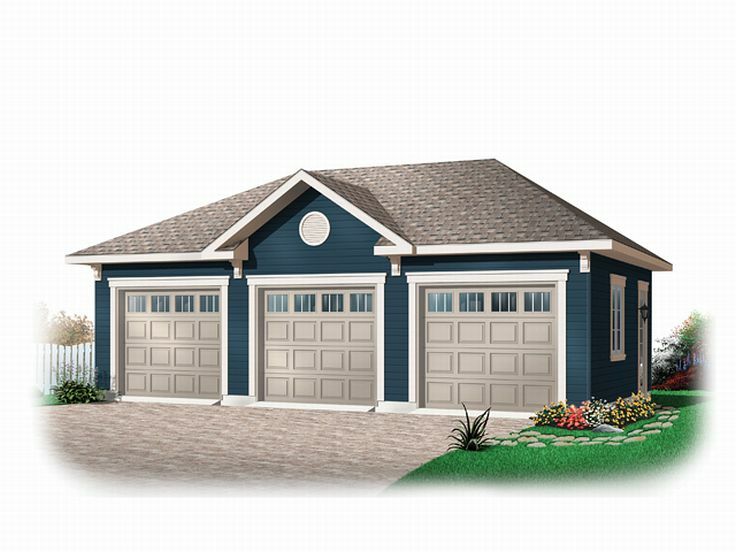 A typical garage apartment plan provides a full bath, compact kitchen and modest living space. Garage Plan with Loft – 012G-0045: Designs like this three-car garage plan with loft offer extra parking and extra storage. In most cases the loft area is accessed by a staircase, and can be used for storage or it can be finished as extra living space such as a home office, workout room, hobby area or home theater. In other cases, the loft is accessed by a pull down stair or ladder and is intended to be used simply for storage or seasonal items and old family treasures that you just can’t seem to part with. Garage Plan with Boat Storage – 050G-0076: Fishing and boating enthusiasts will need a garage plan that offers boat storage. T hree-car garage plans with boat storage are ideal because they offer at least one extra deep bay (28’ deep or more) to accommodate the boat and trailer. One of the other two bays can be used for parking the truck or SUV that is used to pull the boat to the lake, and the third bay can be used for another family car, motorcycle, jet ski or other motorized items. 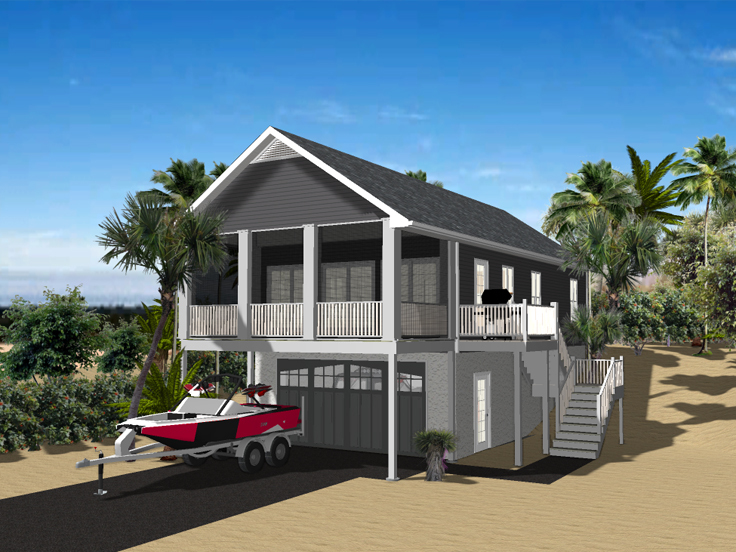 Some garage plans with boat storage even offer a drive-thru bay eliminating the hassle of backing the boat into the garage. Garage Plan with Flex Space – 051G-0037: As your lifestyle and needs change overtime, you might find that a three-car garage plan with flex space would be beneficial to you and your family. These designs offer a typical three-car garage plus a flexible finished space that can be used for a variety of needs. Additionally, the flexible space can “flex and change” just as your lifestyle will over time. It can be used to satisfy your family’s needs now, and it can be adjusted or converted into another space to satisfy your needs in the future. With this specific plan, the recreation and hobby rooms provide a space for the kids to hang out with friends, work on crafts, and discover new things. When the kids are grown and have moved out of the house, you might opt to turn the flexible area into a guest suite for when they come home for holiday visits. Or you might wish to satisfy your own needs a create a workout room, art studio or home office several years from now. No matter what type of 3-car garage plan is suitable for your needs and lifestyle, one thing is certain. Building a new garage will add value to your home and offer more usable space. Are you looking for a garage that offers extra storage? This garage plan with loft can satisfy a wide variety of storage needs. The design offers four garage bays. The two on the left are deep enough to serve as tandem bays an easily store two cars each (three cars each if they are small.) Or perhaps you need to store a boat and trailer or your pop up camper. The outside bay on the left is well equipped for that task too. It offers a 10×10 overhead garage door and an 11’ ceiling. You might prefer to store you boat in the bay on the right. It too has a 10×10 overhead garage door and an 11’ ceiling. The bay is deep enough for storing your boat. The two center bays have 10×8 overhead doors and a 9’ ceiling. They are well suited for parking the family cars. Others might used these bays for parking ATVs, a motorcycle, or jetski. With such a flexible arrangement of garage bays, one might opt to store seasonal items, a pair of canoes, the family bikes or a golf cart. Still others may turn one bay into a workshop or a storage area for basement and attic overflow. A utility room, half bath and service area complete the main level. Finish the second floor loft as a recreation room the whole family can enjoy or maybe transform it into a hobby room, art studio or exercise room. If you can’t think of a way to use the loft space, you can always designate it as a storage room. 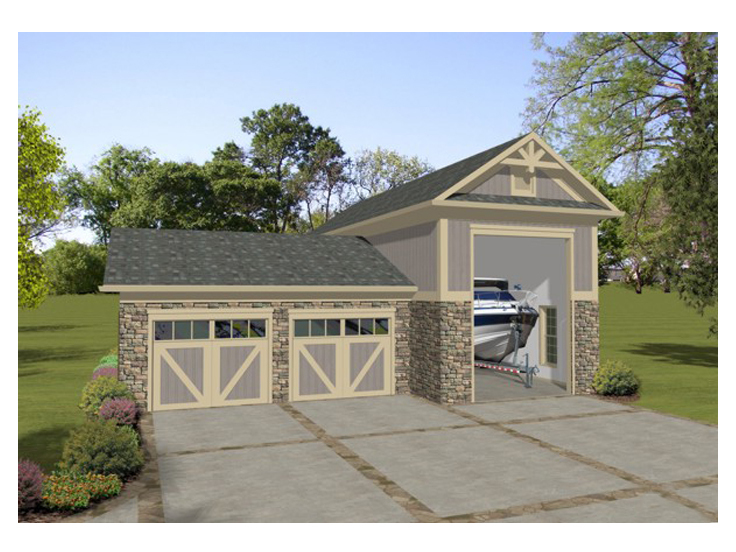 Practical, flexible and designed for various storage needs, this garage plan with boat storage has more to offer than you might expect. 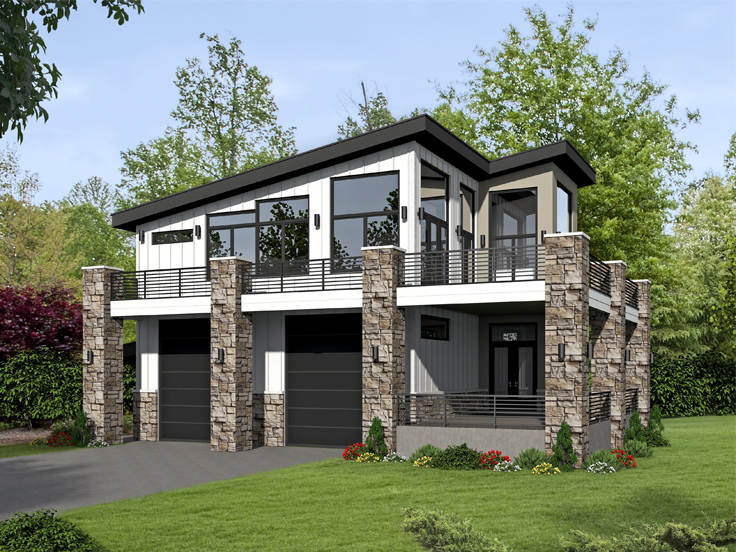 For more designs like this one, please browse our collection of Garage Plans with Boat Storage and Garage Plans with Lofts. 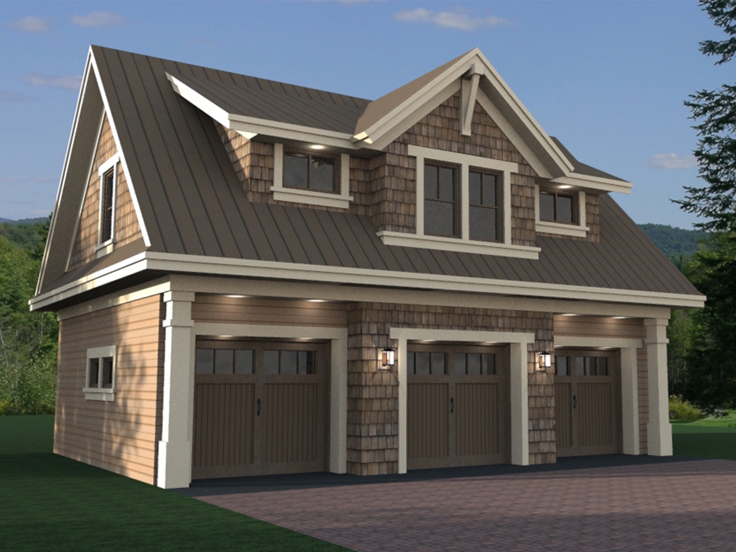 A pair of dormer windows on the left and right sides of this two-car garage loft plan provide curb appeal and natural lighting for the upper level storage loft (512 square feet.) The main level holds a 2-car garage with an extra deep bay on the right suitable for boat storage. The back corner of the left bay offers a workshop area that is sure to please the family handyman. With 918 square feet of usable space on the main level and a 9’ ceiling, the garage space is flexible enough to accommodate a variety of needs. If you’re looking to add parking and storage to your home, this garage workshop plan with boat storage is worth taking a closer look. 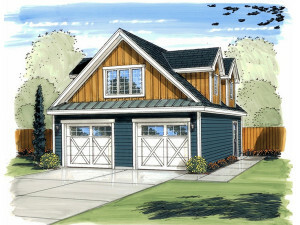 Please visit www.TheGaragePlanShop.com to view more garage plans like this one.